Some of you may have seen this recipe before. Nothing new just thought of adding this to the blog together with last post Penang Laksa. Picture a bit dark I will replace it when I make it again. Laksa Lemak is sometime called Nyonya laksa – this is a coconut curry soup base noodles. Sambal belacan and lime (or local lime called limau kasturi) is commonly serves with this laksa, which you can stir some into the soup or as a dip. Spice paste or rempah, I normally make double the following qty of the spice paste and keep 1/2 in the fridge, will keep for 4 - 6 weeks. 375 – 450g rice vermicelli, soaked or use thick wheat noodles like udon. Roast the coriander seeds and peppercorns. Put in coffee/ spice grinder and ground or you can pound in a pestle and morta. 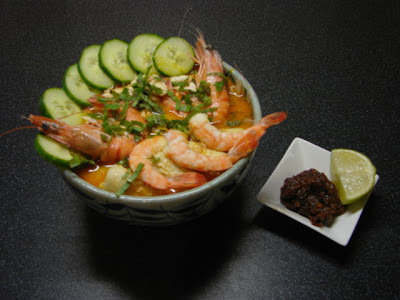 Cut shrimp paste into thin slices and roast on both sides in a dry pan for about 10 – 12 minutes. If using Thai shrimp paste just scrape some into a pan and fry till dry. Put all the spice paste ingredients (incl. oil and water) in a mini blender or food processor and blitz. Cook the paste in a deep large saucepan, gentle heat for about 20 -25 minutes, stirring frequently, till the paste begins to separate and thicken. In another pan, add few ladles of stock and gently poach chicken for about 15 minutes till cooked. Removed then poach the prawns for few minutes till cooked and turned pink. Shred chicken. If you use shelled prawn, peel and leave for later use. Add poaching stock and remaining stock to spice paste and simmer for 20 minutes. Strain the spice soup using a large sieve. Pour stained soup back to the pan add coconut milk simmer till boiling hot. Taste and seasoned with salt if needed. The soup should have a layer of very rich yellow/orangy red oil floating on top. The oil has a lot of flavour. Skimmed if you want to but not all of it. While the soup is simmering, in another large pan fill with boiling water and blanch noodles, drained and divide into bowls. Then blanch bean sprouts, drain and lay on top of noodles. Lay shredded chicken, prawns, fish balls, cucumber slices and hard boiled eggs on top of bean sprouts in each bowl. Pour hot soup into bowl. Sprinkle with a laksa leave or little mint or Thai sweet basil. Serve with a wedge of lime and some sambal belachan in a separate sauce dish. Put every thing in mini blender and blend till smooth. You can use a pestal and mortar. Hi Sunflower, nerdgirl here - used to post occasionally on BBC food. Just made this dish for the second time in as many weeks - seriously addictive. A great recipe and the paste is surprisingly easy to make - usually I have a nightmare getting my blender to make pastes. Have followed your advice and made double. Looking forward to trying some of your others.